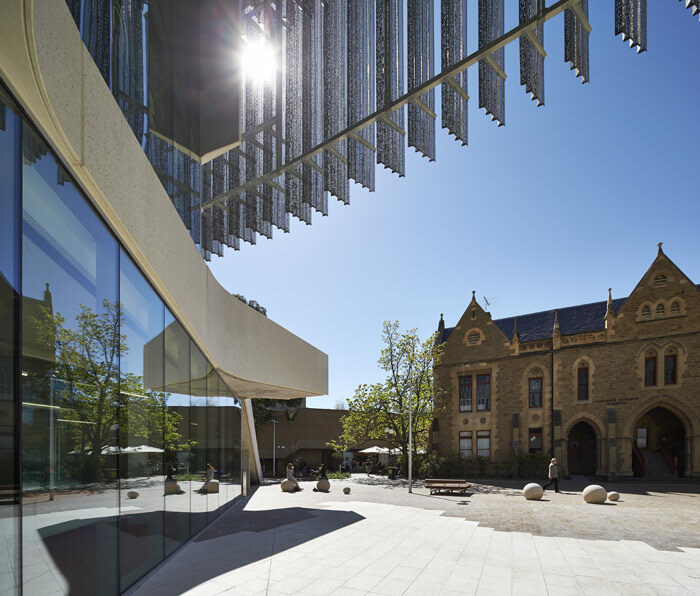 Following an international design competition, Melbourne practice John Wardle Architects teamed up with Boston-based NADAAA as design partners for the new Faculty of Architecture, Building and Planning building (FABP) at the University of Melbourne, Melbourne School of Design. It is a curious collaboration in which the partners operated across all aspects of the project, necessitating a 24-hour working cycle operating between Melbourne and Boston, thus maximising the abilities to meet pressing deadlines and even enabling the project to move ahead of schedule. 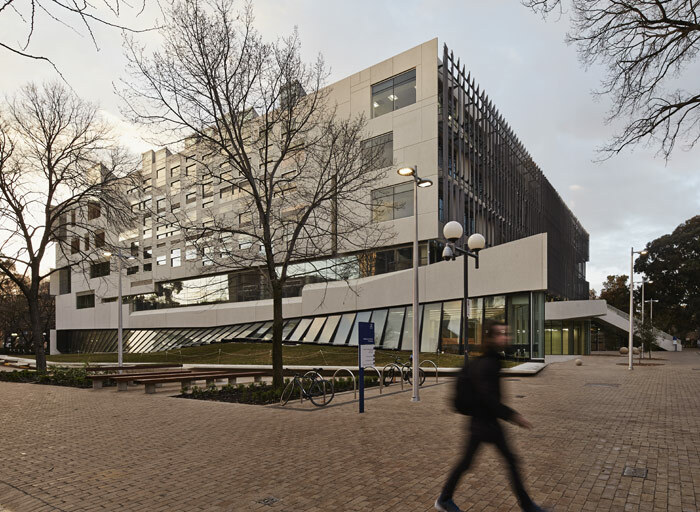 The project responds to planning principles set out in the 2008 University of Melbourne Parkville Campus masterplan and, given the scope, was produced on a relatively tight budget. The building comprises six levels and includes myriad programmatic aspects; the workshops look on to a north-facing courtyard to capture maximum sun exposure (the other way around to the northern hemisphere); a series of exhibition spaces gather around the building's western entrance; a library offers views to a landscaped area on the southern edge of the site; and studio spaces surrounding the atrium offer multiple views of the heritage campus. An array of gallery spaces on the first storey also allow for views down to the lower level, visually connecting the building's users and animating the interior. Given the heritage campus and former architecture school building, the project required a sensitive touch. The design collaboration has considered the former architecture school's situation on site as well as navigation around the current incarnation, namely in the sequencing of spaces. 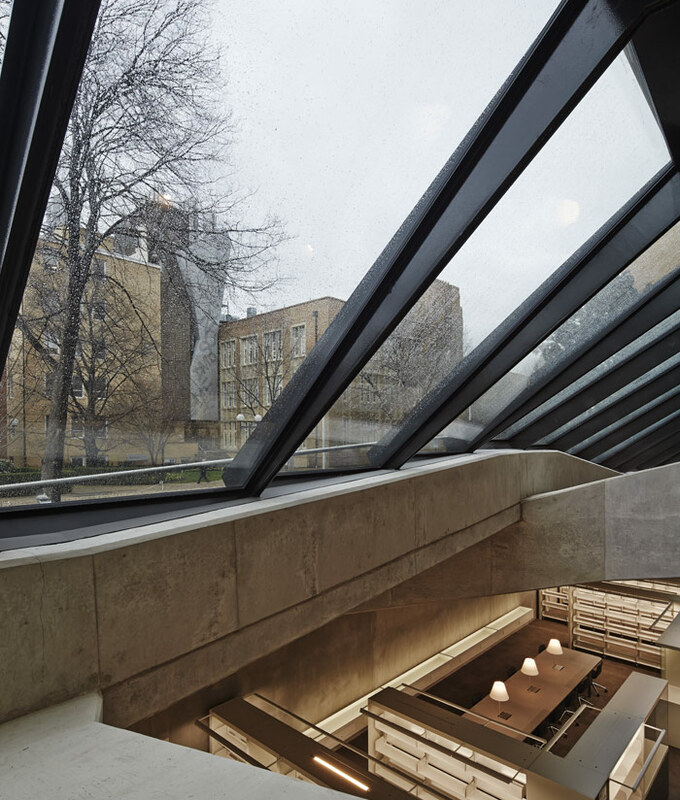 The entry enables users to meander through the ground-floor level which then splits, providing access down into lecture theatres or up into a large atrium and adjacent studio spaces. 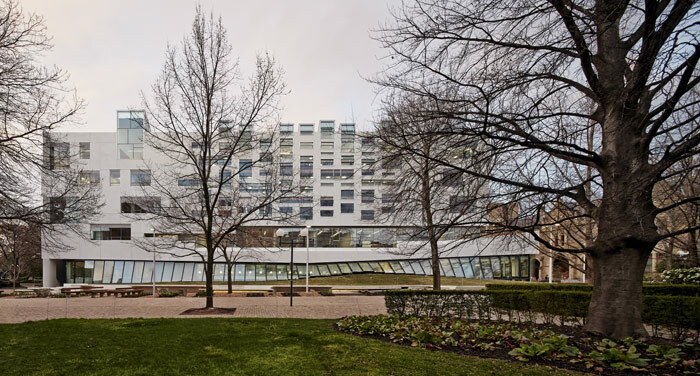 But while the building now offers multiple circulatory paths, it is not as successful as the former faculty building, which facilitated an understanding of the activity beyond these relatively public areas. At the opening ceremony, held in December of last year, many of the guest speakers discussed the new building as 'built pedagogy', a project that more broadly encompasses the university's values, already stout within its remit. 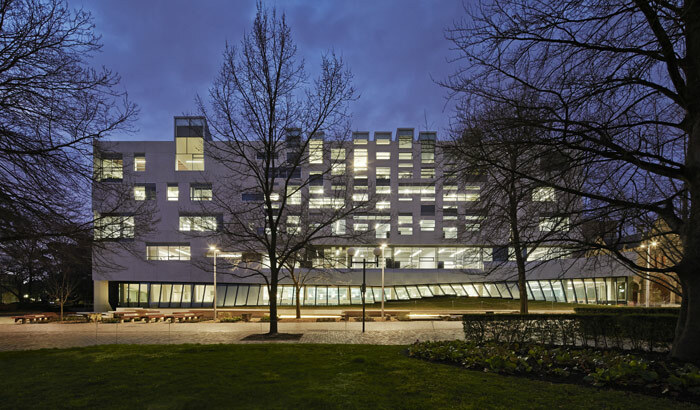 It is intriguing to consider the building as representing the core values of an institution, especially in the shifting nature of further education with off-site learning and altering typologies of the library, workspace, and so on. This building, though, seeks to address the notion of collaboration - the doyen's phrase of contemporary architectural programming. Clients seem focused on collaboration, open-plan learning spaces and the merging of components such as library and cafe. Granted that the project's legibility in programme and method may seem to reflect the built form as a means of communication or mode of education, but in reality is this more a marketing tool than genuine intent? While intricately detailed, the building's design features are simply the manifestation of concise architectural and construction methods rather than coincidentally representing core institutional values. 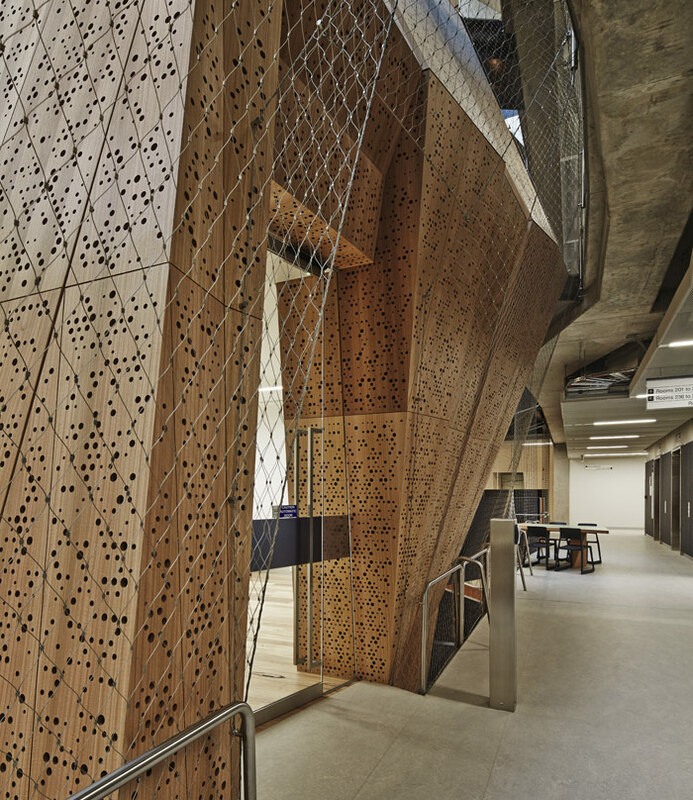 Most notably, the library's sculptural laminated veneer lumber (LVL) beams provide users with a true architectural sensation, while the basement's fenestration beautifully exposes the retaining walls, again exemplifying the idea of raw architectonic resolution. Such powerful architectural expression is also prominent in the envelope, where each facade embraces difference so as to respond significantly to the site context. For instance, the elevation of the 19th-century Renaissance Revival facade of the former Bank of New South Wales required tactful restoration both in design and construction (The bank building, built by Joseph Reed in central Melbourne, was demolished in 1932 and the facade gifted to the university). The design team was not phased by the integration of a relic facade and instead pulled back the surface into the building to create a tutorial area, situated above the full-height volume of the exhibition space. Not only did it understand this as programmatic potential, the design team has also detailed it out to address the connections as designed features rather than cumbersome additions. As such, the application of a plaster surface conceals the supporting steel structure on the existing facade. The signature moment for the entire project is the Design Hall, a large flexible space that caters to students' needs for vital studio space. Not only is the hall the most distinguishing feature, it also represents the epicentre of the building. It is enclosed to the west side by the aforementioned former Bank of New South Wales facade and overlooks the courtyard to the east side. Internally finished with a timber- coffered ceiling that mediates natural daylight and assists natural ventilation, it is a veritable collection of innovative structural and service systems. The voluminous form hangs just a few metres short of the floor, providing a visible diversity within the atrium, while offering private, internalised space in the working studio within. But it is the building's ceiling that is the defining element in the design. 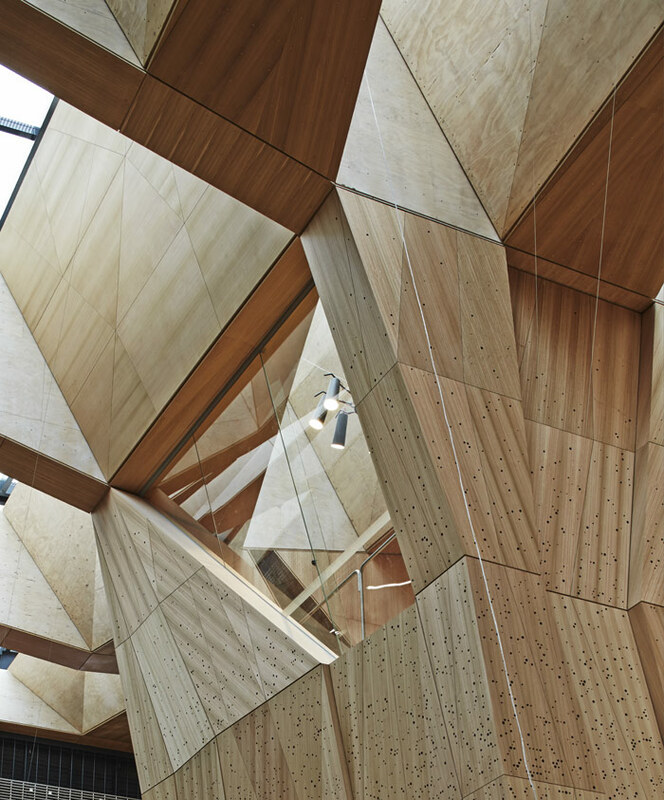 The coffered ceiling - a panelling system comprising perforated components to enable acoustic dampening - clad in plywood is a comparable aspect that can be seen across a number of other projects from both sides of the design team in John Wardle Architects and Nader Tehrani's NADAAA. Notably in NADAAA's work the ceiling is an animated, undulating finish, not merely a planar surface concealing services. The designers experiment with the form and configuration of the ceiling to engage the user both inside and outside. The earliest examples can be found in Upper Crust (2001) and the Inter-faith Spiritual Centre (1998), where a metal-plated, suspended ceiling shows intricate detailing that poetically focuses the user's attention on the ceiling's downlights. Both projects come under the office's previous name, Office dA, with other notable projects including Bina Osteria/Alimentari (2008), with its facetted timber surface providing the sense of a ceiling plane. Tehrani, whether in collaboration with former Office dA director Monica Ponce de Leon or with NADAAA, has always sought to express materials and texture, showcasing dexterity in material use with subtle moves of contortion either in facade or vertical partition. This continues to the ceiling plane. 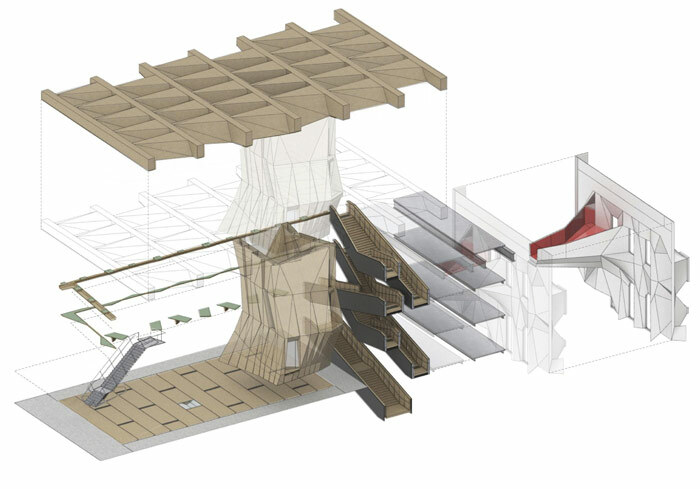 Examples can be found in those projects mentioned, but also in the Gwangju Urban Folly (2011) - a nest structure of individual steel bars, conjoined to form a fluid surface blending column and ceiling plane together - or Bin 26 (2006), where the ceiling is formed through the decorative implementation of recycled wine bottles. 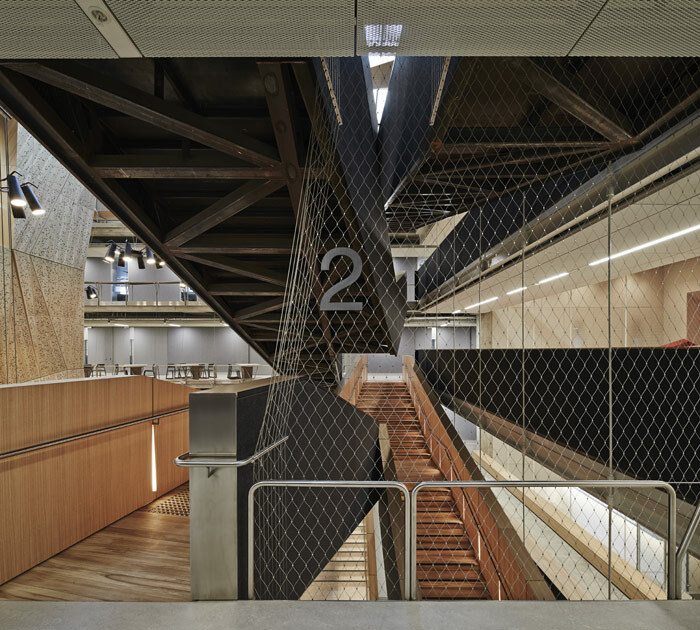 A case point in relation to the University of Melbourne project could be found in Office dA/NADAAA's Georgia Tech Hinman Research Building (2011), where the staircase appears as a carapace draped from the ceiling. 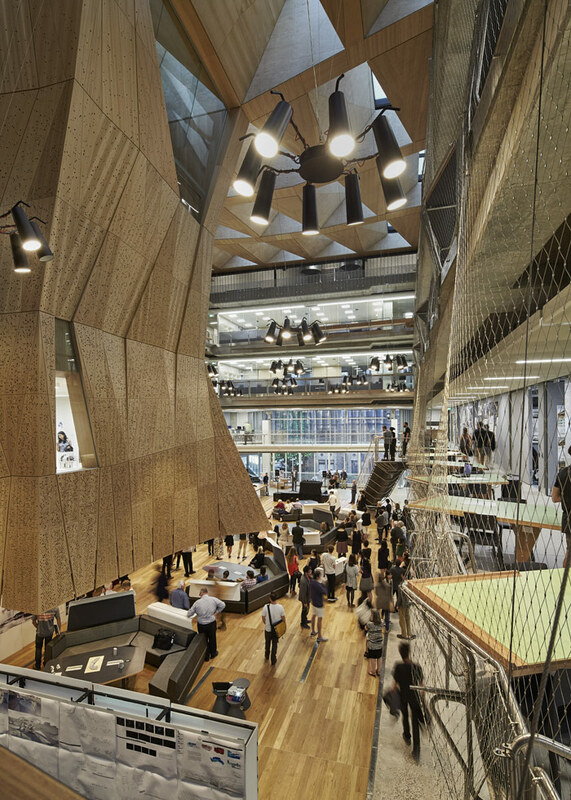 The building's robust material palette is embraced and the architects introduce a dropped ceiling plane to reduce the vast scale of the building volume. 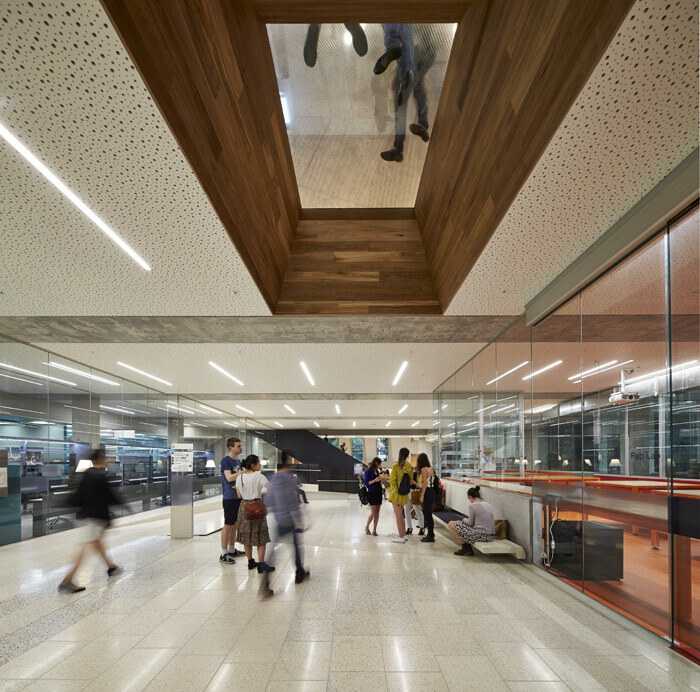 John Wardle Architects also offers intriguing ceiling design resolution, most notably in the Urban Workshop (2007), where the stepped profile allows for light distribution; and, in the lobby at 500 Bourke Street (2012), albeit more conservative in form. Where previously ceilings are suspended to conceal structure or services, or expose each as a redeeming design feature, the ceiling in the design teams' collaboration suggests that it is an element that could be noted as habitable volume. The ceiling has often been overlooked as a design feature, though - the suspended ceiling was more convenience than anything, and the exposure of what lay beneath was simply the inversion of the dropped ceiling. 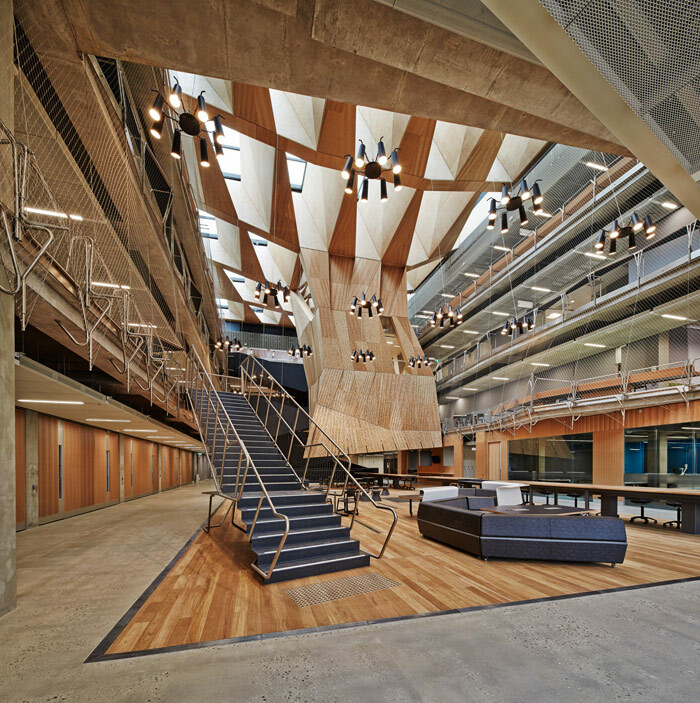 While the design team has had to manage a historic campus setting and heritage facade, it has thrust the ceiling into full view, accentuated by the bulbous Design Hall seemingly hanging as a globulous notation to the structural heft of the ceiling plane.